Several establishments are offering special deals for moms. Several companies will offer freebies and special deals on and around Mother's Day, May 13. However, most of the offers aren't as generous as what many establishments give away for customer's birthdays (see 10 Great Birthday Freebies) or even on tax day. Perhaps it's because restaurants and stores know that people will be taking mom out to give her a break on her special day so they don't need great deals to lure them in. 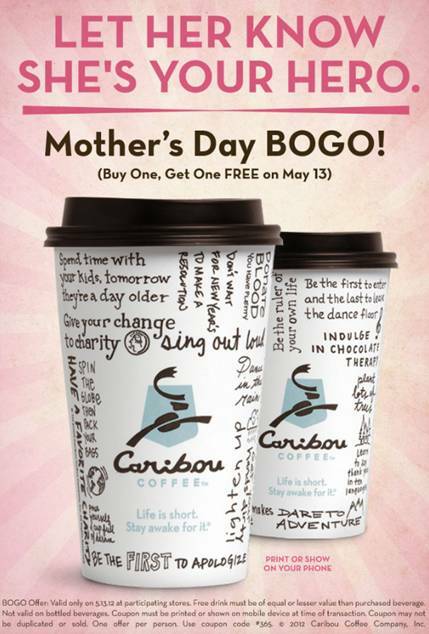 Caribou Coffee has a buy-one-get-one free coffee coupon for Mom on May 13. Champps American Restaurant will give moms who come in May 11-13 a card for $10 off a $25 purchase on the first of every month. Denny's will send Mom a coupon for a free Skillet Cookie a la Mode if you send her one of Denny's Mother's Day e-cards. Fleming's Prime Steakhouse & Wine Bar will give mothers who eat at its locations on Mother's Day a $25 gift card for a future visit. I Heart Faces has three Mother's Day photo-card templates that you can download for free. IKEA is offering a free breakfast of scrambled eggs, bacon, and potatoes and a cup of coffee on May 13 from opening until 11 a.m.
McCormick & Schmicks is giving moms complimentary truffles with brunch or dinner on Mother's Day. Redbox is offering a free movie rental for moms. Visit the Redbox Facebook page to send a card with a free rental code to your mom. Ruby Tuesday is giving moms who dine at the restaurant its "Simply Fresh" cookbook for free on Mother's Day (while supplies last). TCBY will offer a free frozen yogurt to moms on Mother's Day.